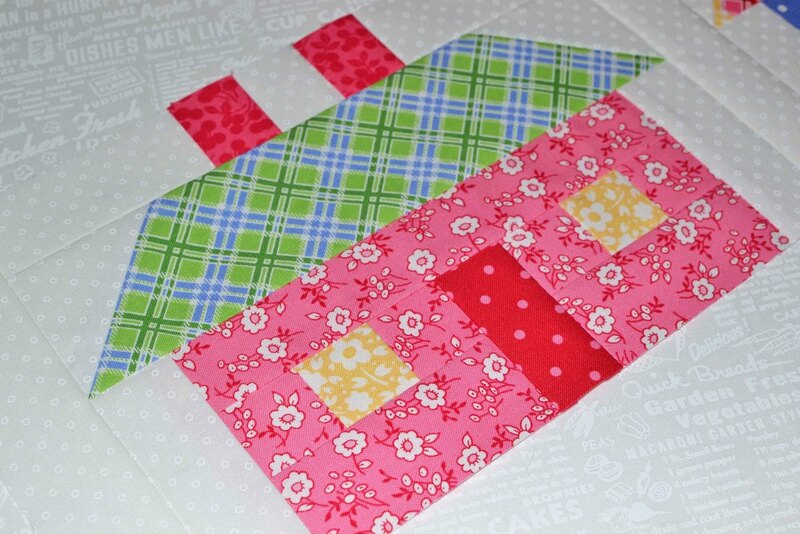 It's week fourteen of the Quilty Fun sew along! And this week's assignment was to build neighborhood houses. Or as I like to call them, little pink houses for you and me. John Cougar Mellencamp's classic "Pink Houses" song was stuck on repeat (in my head) while I built my houses. The lyrics are kinda bleak, but never mind... it's all about the pink house! Pink and green is my most favoritest color combination ever! I often combine pink and green in my blocks. Even my blog got the pink and green treatment, plus grey, of course! I built a little blue and plaid house, too! There aren't any blue houses in my neighborhood (nope, none... I looked), but I wanted a nice contrast to the pink and green house. Wouldn't it be fun to live in a blue polka dotted house? These blocks were sooo easy to sew. I didn't need to worry about the chimneys lining up with the angles of the roof like they do on so many other house blocks. Lori posted instructions on how to join the left side blocks together, and so that means that I'll be back in a few days with an update! Be sure to check out what the other Quilty Fun quilters are up to on the Flickr page here.